Until recently, the health care delivery system mainly was in the hands of the government except a few well run Christian missionary institutions. The government hospitals were overcrowded, under equipped and poorly staffed. Kerala did not have a Medical College until 1951. Until then, the state’s only physician man power resource was through a reservation system of Medical College seats annually in other major states like Madras. The Travancore-Cochin State had reserved 4 seats in Madras Medical College paying a capitation fee, five times that of the Madras students. In 1949 I was selected to one of these seats. Health Care Services were basic in nature. The taluk and district hospitals had specialities like general medicine, general surgery, OBGYN, and paediatrics Specialties like Neurology and Neurosurgery were not even in the planning stage. In 1951, the Government started the first Medical College in Trivandrum. The best 60 students were selected to the first batch. Staffing of the College was by “foreigners”; mainly retired professors from Madras, retiring at the age of 55!. There was a rush to recruit and train new teachers in preclinical subjects for the new medical college. The glamorous clinical departments were Medicine, Surgery, OBGYN, Paediatrics, ENT, Orthopaedics. Neurosurgery was not in the list. It was not in the government’s priority, rightly so. No one was interested in neurology or neurosurgery. Meanwhile, I returned to Trivandrum graduating from Madras Medical College with an M.B.B.S degree without undergoing internship. I reported to the Government since I had signed a contract with the Government to serve them for 30 years. The Government posted me to Medical College Hospital (MCH) as an Assistant Surgeon under Professor Raman. After nine months, I was transferred out of MCH to the general health services. I was posted to be in charge of a Public Health Dispensary in Mallappally, a suburban village of the town of Thiruvalla. At this stage, I requested and obtained permission to go to UK for training in Neurosurgery. In September 1958 I arrived in Edinburgh, Scotland and met with Professor Norman Dott, the pioneer British Neurosurgeon who was a student of Harvey Cushing. He advised me to do fellowship in general surgery as a pre-requisite for admission to the Department of Surgical Neurology (DSN) for 4 years of training. Prior to joining as a first year junior resident in neurosurgery, I was asked to do one year of general surgery including casualty, orthopaedic and general surgery. On July 1 1961 I joined the Department of Surgical Neurology under Professor Norman Dott in Edinburgh, Scotland. A year later Professor Dott retired. I finished my 4 years of training Under Professor John F. Gillingham who succeeded Professor Dott. 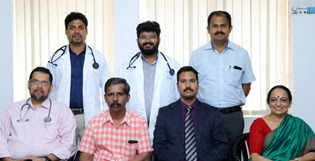 I have the distinct honour of being the first Neurosurgeon in Kerala. In November of 1964 I returned from Edinburgh and reported to Professor Raghavachary, then professor of Surgery and Head of the Department of Surgery. There I was; a fully trained neurosurgeon sent by the government on deputation specifically for that purpose. When I returned they didn’t know what to do with me. There was no department of Neurosurgery in the Medical College or a position in the government Health Services for a neurosurgeon. They woke up to the reality that they have to create a new department. It is a long process, the proposal has to go to the Government Health Secretary from the Principal of the Medical College explaining the need for the department; to the finance department for budget provision; to the education department for setting up qualification for the post and finally to the PSC for procedures to appoint me. This will take months. Meanwhile, they decided to accommodate me into an existing vacancy until the Department of Neurosurgery was created. There was a vacancy in the Radiology Department in the Medical College Hospital. So, the government posted me there on a temporary basis. Professor Raghavachary in his infinite wisdom allowed me to function as a neurosurgeon under him and gave me a free hand. While waiting for the creation of a Neurosurgery Department I started to work as a neurosurgeon in the Medical College Hospital. The following encounters cannot be supported by documented records. In the year 1964 retrievable medical record keeping did not exist in the hospital. These narratives are from my memories. The dates of occurrences may not be accurate. But the events are genuine. Having nothing better to do, I used to follow around the hospital with Professor Raghavachary. I was excited. The first official consultation for a neurosurgical opinion in the first Medical College Hospital in Kerala! I saw her immediately. The patient was an emaciated little girl, appeared to be too small for her age, confined to bed. I propped her up. She had truncal ataxia, head titubation, gross nystagmus and roaring papilledema. Diagnoses was easy: cerebellar abscess from the left ear infection with rapidly increasing ICP. The only treatment was immediate surgery to drain the abscess. In the early 60’s Neurosurgery was still in primitive stage even in Western countries with a horrible reputation! They all died! The treatment was worse than the disease! So went the legend. Diagnostic tests were limited; skull x-ray, myelogram, pneumoencephalogram, ventriculogram and EEG. Angiography was the latest advance. Professor Norman Dott of Edinburgh first used it to demonstrate a ruptured intra cranial berry aneurysm and operate to treat it by placing a ligature on the neck of the aneurysm through a craniotomy. I had the distinct honour of assisting him perform one of these operations in 1962 before his retirement. Even these tests, obsolete by current standards were not available in MCH. I had to think fast; improvise. With the help of a few, curious general surgery residents and a very cooperative OT supervisor by the name Mariamma-I remember her face even now- I took the patient to OT; made a right frontal bur hole under local anaesthesia. Using a metal brain cannula ( I don’t know where I got it from) I punctured the ventricle. I hit the it at the first attempt (not because of my skill but due to the fact the ventricles were hugely dilated due to the blockage of CSF in the posterior fossa) I put 2 cc of Pantopaque, an oil based iodine x-ray contrast material, and took an x-ray of the skull; one view. Voila, there it was! The fourth ventricle was distorted and shifted to the right by a huge mass in the left cerebellum; an abscess. I saw the patient at about noon. The diagnosis was confirmed by 2 pm. By that time all the major cases were over in the OT. All the anaesthesiologists had gone home for the day. Further details are vague. Under local anaesthesia I made a vertical scalp incision bout 2 inches long in the midline of the left occiput; made a 16 mm bur hole using the old fashioned perforator and Hudson Bur. I opened the dura and put a metal cannula at the centre of the bulging cerebellum. I hit the abscess cavity on the first attempt (again not because of my experience or skill but the abscess was so big no one could miss it). Out came about 30 cc of thick, purulent pus. The cerebellum became slack. I close the wound without a drain. That is the first neurosurgical procedure done in Kerala as far as I can remember. It remains unchallenged even now unless some other medical historian tells me otherwise. Next morning at 8 o’clock I came to see the girl. To my surprise, I found her sitting up in bed and eating breakfast! She went on to achieve full recovery and was home in a week; unusual for a brain abscess in those days. That little 17 year-old girl was lucky; during those days all brain abscess had grave prognosis even with surgical treatment. The incident became the talk of the hospital, I became a hero! That didn’t last long. I will tell you about it later. He had the films on the view box. I took a casual look at them. It was simple and quite apparent to any trained neurosurgeon. The myelogram was not normal. They showed classical picture of a ruptured intervertebral disc at L4/L5 with a free fragment of disc sitting on the L5 nerve root. I don’t remember which side it was, right or left. But I did know that it was unilateral. This was about 4 months into my arrival at Trivandrum from Edinburgh. With my lucky break with the brain abscess case, followed by few successful spine tumor surgeries, I had become so self confident to the point of being arrogant. And I did operate on him the next day without microscope, head light or magnifying loop. Under the ceiling light I performed a hemilaminectomy and removed the free fragment of disc. Ten days later he went back to Calicut. I never saw him again. I don’t know his name. The last I heard about him was from Prof. Raghavachry. Six weeks after surgery, he joined his first year class and continued his studies in medicine. Professor Narayana Pai was a legend in the hospital, the most popular medical practitioner at that time in Trivandrum. He was in charge of a medical unit in MCH. All dignitaries politicians included went to him for treatment. Professor Pai admitted a young MLA, (Member of Legislative Assembly) with low back pain to his service. I am not sure about his political affiliation. EMS was the Chief Minister. I think the MLA was a communist. The patient had been seen by every specialist. All the investigations were negative. The patient was having sever back pain radiating to both legs, shifting from one leg to the other. Examination by all specialists showed no positive findings. Investigations led to no conclusions. Eventually, the impression was that all his symptoms were psychogenic; all in his head; an overworked and stressed Communist MLA. So, they called in a psychiatrist. I don’t know what he thought and what he did. I had known “Pai, Sir” previously. We all fondly called him, “Pai, Sir”. I had worked under him in 1955 for 3 months as assistant surgeon before I was transferred out of MCH to be in charge of a Public Health Dispensary in Mallappally near Thiruvalla and before my Neurosurgical training. He was also my mother’s doctor. Professor Pai, out of desperation asked me to see the MLA. Story was simple. A common ailment of backache. A young man in perfect health. No structural abnormalities of spine. SLR was 90 degrees on both sides. No motor or sensory deficits. His knee jerks and ankle jerks were normal. No bladder or bowel symptoms. Somehow, the man struck me as genuine, a solid citizen. I felt his symptoms were real; not in his head. I discussed the case with “Pai, Sir”. I told him that he could have a tumor. I suggested a lumbar myelogram. He agreed having no other options. I took the patient to the X-Ray Department; did a lumbar puncture; put 10 cc of Pantopaque and looked under the fluoroscope. It showed a well defined cherry size filling defect in the conus medullaris region (L1/L2) with a meniscus. When I tilted the X-Ray Table, the “cherry” moved up and down, a floating nerve root tumor, a benign schwannoma. I cannot remember seeing such a phenomenon ever. It is a delight for a neurosurgeon and very lucky for the patient. The next day I performed a simple laminectomy at the site of the tumor, opened the dura and picked out the “cherry”. The man recovered fully. He returned to his active political career. I had no follow-up information clinically or politically. . These reports are anecdotal; no documentation; I only know these encounters occurred sometime between Jan and November 5, 1965. How do I know? Tell you later. With the “cherry picking” method of case selection, I made a good name for myself as a neurosurgeon and for neurosurgery as a speciality, to reckon with. I was young, proud and self assured. A neurosurgeon with an enormous ego. I loved a good life; rented a big house near the hospital and college. Professor. Krishna Das and Vakom Purushothaman, the budding politician, were my neighbours With the money I had saved during my 5 year stay in Scotland and one year in London, I had bought an MGB sports car; strikingly red and eye catching. I imported it to India as part of my transfer- of-resident-baggage. One of its kind in India Although poor and brought up in an impoverished village, I led a flamboyant life style, ran around in Trivandrum city in my red sport car. This attracted the attention of the elites in the city. I was introduced to the “who is who” in Trivandrum. I loved the attention I loved the life. I was happy. Emboldened by my success during the initial days, I was willing to take risks in doing neurosurgery; beyond my skill and experience without needed equipment. Then a series of disasters struck. I saw a middle aged lady with gradual onset of deafness in the left ear. Over a period of months she lost hearing completely on the left; developed left facial paralysis; numb face. She had difficulty in walking, talking and swallowing. On examination she showed signs and symptoms of a full blown left cerebellar tumor presumed to be an acoustic tumor; confirmed by ventriculography. I decided to operate. With the help of the very same cooperative OT Nurse Mariamma I operated. Neuroanesthesia was unheard of in those days. Under regular general anaesthesia I positioned the patient in the sitting position. Through a Cushing Cross-Bow incision, I made a posterior fossa craniectomy. The dura was bulging and tense. Visualization was poor by the overhead light. Looking back, I don’t know how I did it. I excised the left cerebellum to access the tumor. It was a bloody mess!. Bipolar cautery was not being invented Further details of that surgery are vague in my memory. I am not sure whether I saw the tumor or took a biopsy. I had to abandon the procedure due to excessive bleeding. Sad to say that the patient didn’t wake up from anaesthesia and she died within 24 hours. It was a blow to my ego. The reasons for the tragedy were obvious. Primarily, my lack of experience lack of judgement. That was the first acoustic surgery that I attempted to do. Not enough equipment, lighting, magnification, microscope, micro instruments and a host other factors. Depressed and disappointed, I wrote a long letter to my mentor Professor Dott in Edinburgh. Promptly I got a reply from him. I had kept the letter safely. Now I can’t find it. But I remember the last sentence vividly like he spoke to me yesterday., “Mr. B” (surgeons are called Mr. in UK), He wrote,” like Dr. Harvey Cushing, you should be satisfied with an intracapsular excision of the tumor instead of trying to remove it totally” Not true any more. Dr. Walter Dandy changed the procedure to total excision of acoustic to prevent recurrence, as it is universally practiced today. An elderly gentleman came to me with intractable left facial pain not responding to medical treatment. He was in agony; unable to eat or drink. So, I decided to do the classical Frazier operation; sensory ablation of the Gasserian ganglion in the Meckel’s cave. I did a subtemporal craniectomy on the left side in sitting position. Lifted the temporal dura. I couldn’t reach the Gasserian Ganglion. Procedure was abandoned. Post operatively, not only the patient did not get any pain relief but also lost his facial nerve function. He was an unhappy man. I don’t remember what happened to him later. While I was into my fourth month of neurosurgery career in Trivandrum, Pakistan attacked Indian occupied Kashmir on April 29, 1965 under the code name OPERATION GIBRALTER.------------------ Both sides lost men and material. Casualties mounted. Hostilities stopped in September 1965. Post war victims accumulated in Command Hospitals in the North, Delhi, Lucknow, Allahabad. India was unprepared to handle health Care needs of the war victims. Government of India started an emergency recruitment program to procure medical personnel to handle the situation through a process of Emergency Commissioned Officer Recruitment. In 1965, there was no qualified neurosurgeon for the entire Armed Forces of India; Army, Navy and Air Force put together. Orders went out of Defence Ministry to procure one from the country’s Health Care resources of the Indian States under the provisions of Emergency Commission Recruitment Act. A request came from the Secretary of Defence, Govt of India to the Chief Secretary of Kerala to search for a neurosurgeon. I had arrived from Edinburgh in November 1964 with my Neurosurgical Training. Since I was deputed by the Kerala State Government to UK for training and since I was under contract to serve for 30 years, they targeted me as a recruit. There was no official draft for compulsory military service, the government couldn’t force me to join the Army. They used persuasive tactics. The government guaranteed my job security upon return from the Armed Forces with double promotion. They also used a veiled threat that if I didn’t go to the army it will affect my seniority and promotions in the State Health Services. I was called in for an interview by Principal of the Trivandrum Medical College, Professor Thankavelu. I met him in his office . I was kind of afraid of him. A well known pathologist by profession and the Head of the Department of Pathology he was known as an excellent administrator. He had a reputation of having his own way. He had his favourite candidates to appoint and promote to important positions in the college and hospital. I was not one among them. In 1958, he didn’t recommend me for the Neurosurgery training when I applied for it. However, I managed it on my own. Perhaps, he remembered that incident and held it against me. The reason, I guessed was because I came from Madras Medical College as an outsider. He looked at me over his reading glasses with a condescending stare. I got the impression that he was implying that he cannot guarantee my position when I return from the Army. In hind site it turned out to be correct. I left his office without giving him a final answer. I pondered over it. I was happy with what I was doing, well accepted and recognized as a capable neurosurgeon in spite of some of my professional disasters. There was no money in it. My salary was Rs.500 per month. I had to maintain my MGB sports car, pay the rent on my big house. Nothing left to support my wife. I was allowed private practice. I couldn’t do it. By nature, I was unable to take money from a patient. Going to the Army will be a big financial help. Second, I hoped this will secure my job in the Kerala Government Service with double promotion and seniority, as promised, when I return. Subsequent events proved my hopes were misplaced. On November 5, 1965 I left Trivandrum to join the Army. That was the end of my career in the Government as Kerala’s First Neurosurgeon.